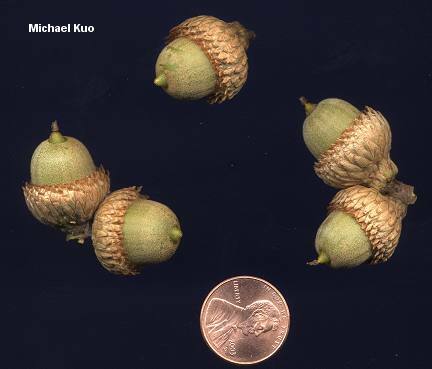 Acorns encased halfway or more, in a cup with free-tipped scales; buds fairly large, finely hairy, grayish brown; leaves lobed, with bristle tips, with some sinuses more than half way, with hairy, coppery undersides; bark not appearing striped from a distance; growing in eastern North America. Note: The red oaks (those with bristle-tipped leaves) of eastern North America are notoriously difficult to separate--a task compounded by the fact that the trees often hybridize in nature. 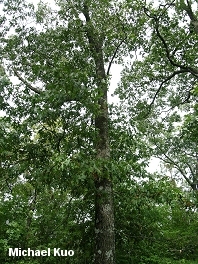 Habitat: Able to grow in dry or moist soil; often in mixed stands; east of the Great Plains. 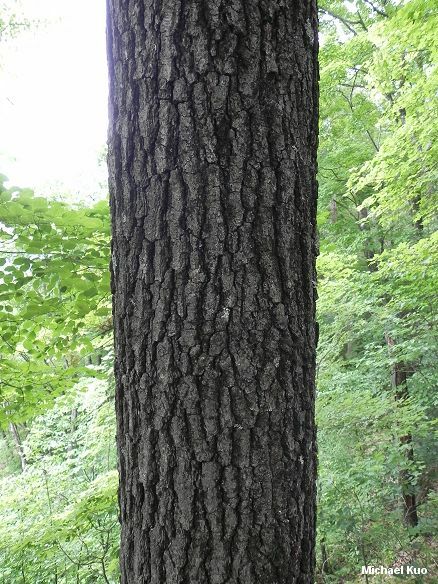 Stature: 50-100 feet high (or larger); to 3 feet in diameter; with an irregular, rounded crown. 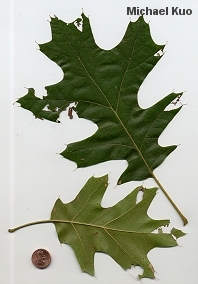 Leaves: With bristle tips; 5-9 inches long; with 5-7 lobes; one or more sinuses often extending more than halfway to the midrib; dark green and shiny above; pale green or, often, with a coppery orangish sheen below, with many hairs creating a fuzzy feel. 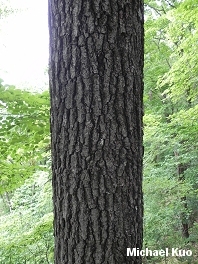 Bark: Dark gray to black; thick; deeply furrowed; with narrow ridges in age, but not appearing "striped" from a distance. Acorns: Bitter; to 3/4 inch long; enclosed for 1/3 to 1/2 of the length, in a cup with free-tipped scales; appearing every two years. 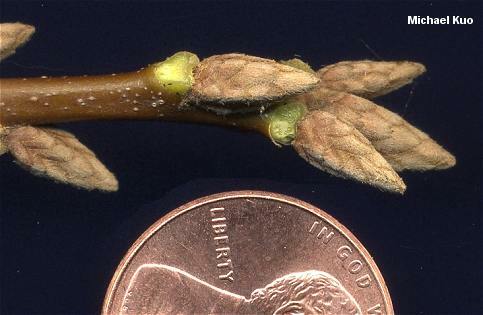 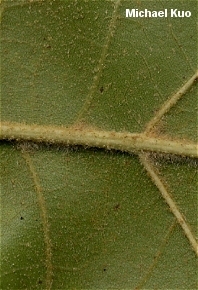 Buds: About 1/2 inch long; finely hairy or fuzzy; 4-sided; grayish brown.